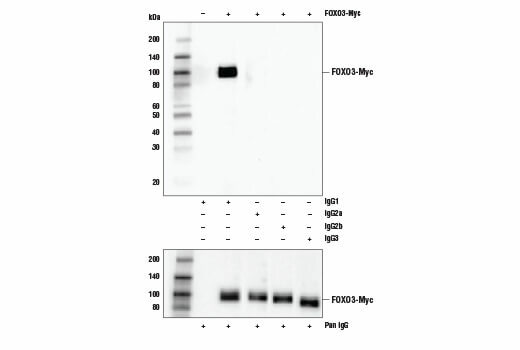 Western blot analysis of extracts from untransfected control cells and transfected cells overexpressing FOXO3-Myc using Myc-Tag (E7F9B) Mouse mAb as the primary antibody. Various anti-mouse isotype specific antibodies (upper) and Anti-mouse IgG, HRP-linked Antibody #7076 (lower) were used as secondary antibodies. Confocal immunofluorescent analysis of 293 cells stably expressing Myc-tagged ADORA2A (left, positive) versus wild-type 293T cells (right, negative) using Myc-Tag (E7F9B) Mouse mAb (green). Samples were mounted in ProLong® Gold Antifade Reagent with DAPI #8961 (blue). Confocal immunofluorescent analysis of 293 cells stably expressing Myc-tagged ADORA2A (top, positive) versus wild-type 293T cells (bottom, negative) using Myc-Tag (E7F9B) Mouse mAb (green; mouse IgG1), RCAS1 (D2B6N) XP® Rabbit mAb #12290 (yellow; rabbit IgG), and Lamin A/C (4C11) Mouse mAb #4777 (red; mouse IgG2a). Samples were mounted in ProLong® Gold Antifade Reagent with DAPI #8961 (blue). 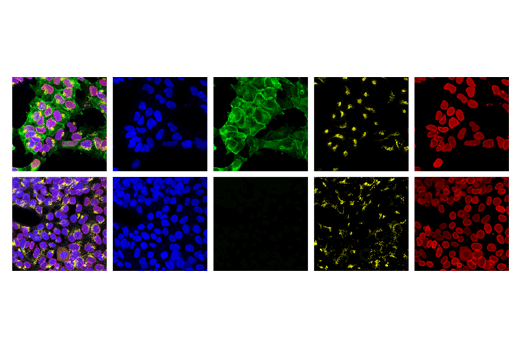 Myc-Tag (E7F9B) Mouse mAb detects recombinant proteins containing the Myc epitope tag. 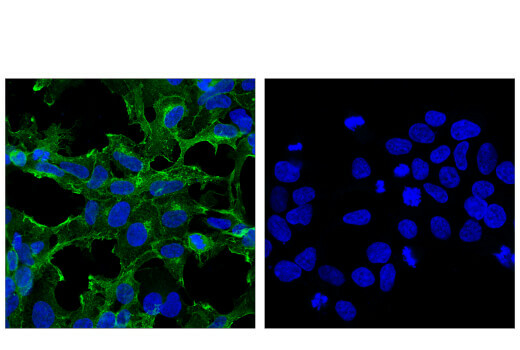 The antibody recognizes the Myc-tag fused to either the amino or carboxy terminus of targeted proteins in transfected cells. Monoclonal antibody is produced by immunizing animals with a synthetic peptide corresponding to residues surrounding Glu416 of human c-Myc. The Myc epitope tag is widely used to detect expression of recombinant proteins in bacteria, yeast, insect, and mammalian cell systems (1). Munro, S. and Pelham, H.R. (1984) EMBO J. 3, 3087-3093.